Britain: Labour Party Finds Itself Innocent! The findings of this inquiry have now been published and amazingly the Labour party has found itself innocent. In British left-wing politics, you cannot even clear yourself of accusations of anti-Semitism without having an outbreak of it right there and then. Readers who have followed the UK Labour party's recent travails will be surprised to hear the results of the party's latest inquiry into its own behaviour. After a slew of anti-Semitic comments emanated from a Member of Parliament, a number of councillors and a member of the party's executive committee, party leader Jeremy Corbyn finally ordered an inquiry into anti-Semitism in the party. The findings of this inquiry have now been published and amazingly the Labour party has found itself innocent. But even that has not gone down without incident. The Labour party's anti-Semitism problem began to be exposed at the start of this year when stories of routine anti-Semitism emerged from a junior wing of the party -- specifically the Oxford University Labour Club. That scandal involved a number of resignations, and revelations of the use of anti-Semitic language as routine and commonplace among Labour students at Britain's most prestigious university. An inquiry into these events, ordered by the party and conducted by Labour's own Baroness Royall, promptly found "no evidence" of "institutional anti-Semitism." Then came the scandal of Naz Shah MP, who was suspended from the party pending an investigation into messages on social media, as well as the suspension of a number of Labour councillors for posting anti-Semitic content on Facebook and other sites. Kerosene was promptly thrown onto this smouldering fire by National Executive Committee member, Ken Livingstone. The former Mayor of London used the opportunity of an anti-Semitism row to go on the BBC and talk about which early policies of Adolf Hitler's he thought the Jewish people had agreed. The resulting firestorm culminated in Mr Livingstone locking himself in a disabled lavatory at the BBC while journalists shouted questions about Hitler under the door. Sensing that his party was in difficult public-relations waters, Jeremy Corbyn ordered an inquiry into the Labour party's anti-Semitism problem, and asked left-wing campaigner Shami Chakrabarti to conduct the inquiry. Chakrabarti promptly joined the Labour party and started work. On Thursday of last week Chakrabarti produced her findings. At an event in London organised by the Labour party, she announced that the Labour party was not in fact overrun by anti-Semitism "or other forms of racism," but conceded that there was an "occasionally toxic atmosphere." She also added that there was "too much clear evidence... of ignorant attitudes." 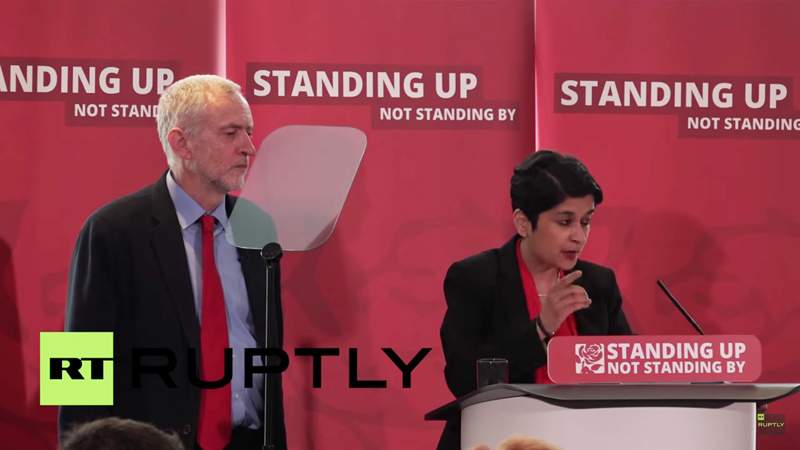 UK Labour party leader Jeremy Corbyn (left) appears at a press conference with left-wing campaigner Shami Chakrabarti (right), to present the findings of an inquiry into the Labour party's anti-Semitism, June 30, 2016. The man she was helping to vindicate, Jeremy Corbyn, then took to the stage and called for an end to Hitler and Nazi metaphors, and an end to comparisons between different human rights atrocities. He went on to say, "Racism is racism is racism. There is no hierarchy, no acceptable form of it." In the hands of anyone else that might have been an end of it, but this is the modern Labour party of Jeremy Corbyn, and in the modern Labour party of Jeremy Corbyn no opportunity for a public relations catastrophe is ever missed. And so it was that at the launch of an inquiry into anti-Semitism a set of anti-Semitic incidents occurred. "Our Jewish friends are no more responsible for the actions of Israel or the Netanyahu government than our Muslim friends are for those various self-styled Islamic states or organisations." This none-too subtle linkage between Israel and ISIS was promptly seized upon by commentators and religious leaders. Chief Rabbi Ephraim Mirvis condemned the comments as "offensive," and stated that rather than rebuilding trust with Britain's Jewish community, Corbyn had in fact caused even "greater concern." Former Chief Rabbi Jonathan Sacks called Corbyn's comments "demonisation of the highest order, an outrage and unacceptable." He went on to say that the comments showed "how deep the sickness is in parts of the left of British politics today." Meanwhile, in the audience of the event, a Labour MP who is Jewish -- Ruth Smeeth -- found herself the victim of anti-Semitic slurs from one of Jeremy Corbyn's hard-left grassroots supporters. This individual insisted that Ms Smeeth was working in collusion with the "right-wing media" -- an anti-Semitic trope of precisely the kind at which the Chakrabarti report had been meant to look. Corbyn failed to intervene, so the Jewish MP walked out of the event. "It is beyond belief that someone could come to the launch of a report on anti-Semitism in the Labour Party and espouse such vile conspiracy theories about Jewish people, which were ironically highlighted as such in Ms Chakrabarti's report, while the leader of my own party stood by and did absolutely nothing." Yet here we are. It is 2016 and in British left-wing politics you cannot even clear yourself of accusations of anti-Semitism without having an outbreak of it right there and then. There are those who have long noticed this fact. There are also those who have long rued this fact. But only the current leadership of the Labour party can imagine that they are going to get away with avoiding this fact. Douglas Murray is a current events analyst and commentator based in London. Related Video: Douglas Murray on "Anti-Semitism in Britain's Labour Party"
It seems the Labour Party have fallen for the Popular 'story' to claim that Israel is backing ISIS to defame Islam! Such propaganda must not be believed, planting confusion in the minds of those who want to accept Islam, warts and all! TAQQIYA (lying to put the minds of the infidel at ease) is used worldwide by Islam. Meanwhile the worldwide growth of Islam by use of immigration, marrying four wives and dozens of children (all receiving state benefits in their adopted countries), mean that in 20 years time, Muslims will outnumber us, thus enabling the insistence of worldwide SHARIA law, taking us back into the dark ages! Forcing populations to convert to Islam, otherwise slavery or death! WAKE UP, before it is too late. Glad to hear there are still people who understand and see the truth! The media is biased against Israel and the left wing doesn't want to see it. Their position is so antisemitic that they agree with all the lies and add their own negative feelings. Thoughout the UK, the EU and even the United States, politicians, the media and the majority of people are tight lipped when it comes to criticising the mass immigration of Muslims and much of their anti-social and threatening behaviour (if this trend continues much longer the Islamisation of Europe will be a walk in the park for Islam.). But when it comes to Anti-Semitism there's no shortage of people to vent their latent sense of racism. Just look what popped out of the British Labour Party closet recently. Anti-Semitism is so blatent and widespread that the party leader (leader? lol) Jeremy Corbyn himself a known anti-Semite, who admits he is a friend of terrorists, was forced to order an inquiry into it. What with Labour MP Naz Shah's remark that all Jews in Israel should be forcibly moved to America. And Ken Livingstone's talk on the BBC about the policies of Adolph Hitler that he thought some Jews might like (which resulted in him fleeing from journalists and hiding in a lavatory). And the routine left wing bullying and antisemitism on our University Campuses that usually culminates in "Israel Apartheid Week" and the resignation of Jewish students. And the suspension of some Labour Councillors for their antisemitic comments.Even on the very day of the Inquiry's findings,Jewish MP Ruth Smeeth received an antisemitic slur from one of Cobyn's supporters,which Corbyn chose to ignore according to reports. So what was the result of the inquiry BY the British Labour Party into antisemitism IN the British Labour Party? It was that there is "NO evidence of institutional Anti-Semitism in the British Labour Party." Of course there isn't. This is Britain. Labour has become the stamping ground and epicentre of the amalgam of Classic Antisemites, "Progressive" Anti-Jewish Racists; and 7th-Century-Based Islamists. The goal of this amalgam is to DEMONIZE the liberal-democratic and sovereign nation-state of the Jewish people; to DE-LEGITIMIZE the State of Israel and the People of Israel, i.e. the Jewish people; and to seek the very DEMISE of each. This is the manifestation of 21st-century-model of deadly Antisemitism!! his own comments and by a sham inquiry into anti-Semitic and anti-Israel remarks by members of his party. If and when Abbas and the Fatah party agree to a two state solution whom will Jeremy Corbyn and his anti-semitic cohorts then slander? Two points: (1) One must not always assume that a charge of (say) "conspiracy with the media" is ipso facto an "antisemitic" trope, or play the ill-chosen wording up as such. Incidentally, Comrade Corbyn claims some Jewish ancestry, and his parents "fought" [the police] at Cable Street - didn't they all? (2) Nevertheless, anti-Jewish attitudes have been found on the "Left" of politics nearly as much as on the "Right" - Karl Marx, Mikhail Bakunin, Henry Hyndman and the Webbs are examples; I personally think Ernie Bevin is unfairly so stigmatized because of his irritation with Zionists, and Oswald Mosley got on well enough with Jews during the first decade or so of his political life. The scholarly studies by Jerry Muller on Jews and Capitalism and by Andre Gerrits on Jews and Communism are worth consulting. In 2009, The Scott Group (The Guardian etc) put together the above named convention under this headline "A call to all concerned with attacks on our fundamental rights and freedoms under pressure from counter-terrorism, financial; breakdown and the database state". This content is still on the internet so, if interested, I urge you to view it. I became quite excited when I read it as it seemed to be a genuine, concerted effort to approach much of that which afflicted Britain by people who had a clear and strident public voice. The cast list is impressive. I never got to go to any of the meetings and, surprisingly, this convention - which must have taken much money and effort to put in place - seemed to evaporate as quickly as it had appeared. I often pondered the cause but in early 2016 I attended a meeting in a Commons committee room where coincidentally one of the main movers in the convention was in the chair. After the meeting closed I asked him the question: "What happened?" He said, "Oh, it was closed down by one woman". It seems that she gets around. Anti-Semitism in the Labour Party (and elsewhere too, probably) seems to be much more accepted (if not acceptable) than any amount of islamofauxbia. Deranged minds at Wasteminster are disconnected from reality but the supporters of the Labour Party seem to be similarly incapacitated. When Labour voters wise up to how much their unthinking support is taken for granted, they might, just might, begin thinking and change their red rosettes for purple ones. I'm not holding my breath here, but I do see straws in the wind. Is anybody really surprised at this result when it has been carried out by one of these do gooder bleeding heart liberals who as Mr Corbyn states repeatedly "I am against any form of racism" unless of course Jews are the victims, their stance would be laughable if it wasn't so pathetic. Yes the hammer and sickle should be their flag while comrade Corbyn and his ilk lead the Party. In every Enterprise or Bank or even in a small Grocery " You can not be the Cashier and the Accountant at the same time "
The Brit Labour Party's self-vindication on the charge of anti-Semitism should not come as a surprise, and that incurable infection is not confined to the Left. It is endemic in the UK. It is also no surprise that the connection is regularly made between the Jewish people at large and the action that Israel takes against those poor 'Palestinians'. In the 1930s/40s it was a regular experience for Jews here to be told to "go back to Palestine...back to Jerusalem...back where you came from", and now, in the 21st century, when Jews have succeeded in restoring our nation state in the land of Israel, we are told that we have no right to be there! Douglas Murray's short attached video is spot on. As long as Corbyn holds on there is no chance of this cancer within the Labour Party being addressed. Sadly if he steps aside the chances will not be greatly improved. Nothing new here. It was the Labour Party, under prime minister Atlee, that did everything in its power to destroy the nascent nation of Israel in 1947-1948. Dispensation Labor Parties. Even when we are wrong we are right and we were right then, even if we are wrong now. All it takes is greed and idiocy. Isn't that nice, they have found themselves innocent of anti-Semitism and racism? The party have a background of this sort of thing, it is traditional. If a bad case floats to the surface they get ejected and of course return after a decent interval (eg Livingstone). The Chakrabarti woman, the Indian human rights enthusiast, would of course find Labour clean. Maybe she is seeking a safe seat, but on which side after the Corbyn split of the party ? Let us hope the split takes place before the next election. I happened to see this confrontation and Ruth Smeeth was right to walk out. This article has once again shown us the censorship being forced upon the British people when it comes to Muslims! The person in question who insulted Ruth Smeeth was a Muslim! We are now at a stage in Britain where all parties are living in terror of upsetting their Muslim voters. They are far less worried about security and the safety of the people, they just want the Muslim vote. God help us! Personally, if I had been in the audience, I would have stood up and punched the out of order Muslim on the nose, but not even Corbin said anything to defend Ruth Smeeth. Pathetic political posers, interested in their own careers and futures. As for Shami Chakrabarti, she is another with self interest at heart and she actually did nothing to prevent this attack on Ruth and couldn't be bothered to speak out about it afterwards! Labour is responsible for the high level of Muslim immigration into this country during their years in power. They still haven't quite realised that it is this that has made them unelectable now and in the future. To also show that Jews are not as important as Muslims is a big, big mistake. Far more people will support the Jewish community in this country because they at least don't try to kill us and they make a great contribution to society. This anti-semite racist is incredibly two-faced. 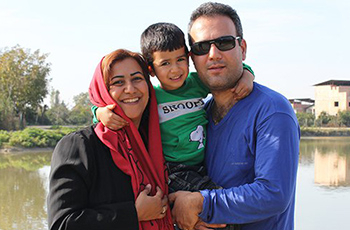 This person took money to appear on "PRESS TV" an Iranian Media outlet, that has been banned in many countries the UK included for it's blatant hatred of Israel and Jews. Corbyn appeared several times, after the UK authorities banned it. He was paid several thousand pounds for each appearance on this "Press TV" knowing of it's ban and its anti-Jewish anti-Israel stance and rhetoric. So why am I not surprised that he found himself and his party "not guilty" what a lying hypocrite he is. The good news is, his own party are ready to "out" him. Then he will sink into the obscurity he was used to before he was voted leader of the Labour party. Get used to it --- Antisemitism is here to stay!!! It comes and goes like bad wheather, since the first Jew (Abraham) came on the scene. It took the Holocaust to give the Jews THEIR country back. Sounds shocking, but IT IS the truth. I believe that if it would not have been for the Holocaust, we would not have the State of Israel --- even Europeans can feel guilty occasionally. Unfortunately, the statue of limitation for feeling guilty about the Holocaust is over and Antisemitism IS back in style. As for Jeremy Corbyn, he is nothing more than a typical Antisemite --- pure and simple. That is his occupation and his problem. Sadly, there are too many like him in Europe and around the world today. As I said before --- Antisemitism comes and goes like bad wheather, get used to it and have a very HAPPY FORTH OF JULY. Thank you Douglas Murray and Gatestone. As usual, denial, obfuscation, lashing out at those opposed to their views. Grandiose ideas and jargon ridden language are the tactics of the Leftists and this is no different. I know we are still embroiled in the giant hissy fit which has gripped the left/liberals/media/commentariat/establishment/celebs/children and assorted Very Angry People following the Brexit decision, but even so, the events revealed in the links show just how far the skewed and dangerous double standards applying to Israel and the Jewish diaspora have spread their tentacles. I have no doubt that Corbyn's disgusting equation of Israel and ISIS was engineered by his dwarfish spin doctor Seamus Milne. Milne's obsessive hatred of Israel and his obscene embrace of Palestinian terrorism was formerly expressed in the pages of the Guardian. Now he's using the Labour party to advance his bigotry. I'd say Milne has emboldened the Jew-haters in the Labour party.